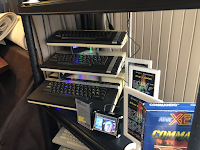 We have started with the preparations for the 3rd annual Atari Invasion of the HCC Commodore meeting. On February 17th 2018 we will again take over 'het Trefpunt' in Maarssen (NL). Our small museum rack and display cabinet will be there, filled with Ataris, home-brew and more. Plenty of paper items will make their way to Maarssen and perhaps even to your home! If we can convince the right people, we will clear enough space to preserve some of your classic games and other precious software from floppy disks and/or cassettes. Some of us were at Silly Venture at the beginning of december and participated in the compos. It is only fitting that during the Invasion we will show a couple of demos (old and new) on at least three systems! 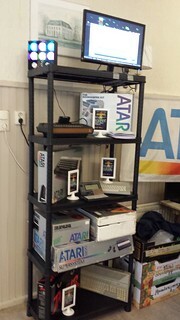 It won't be just classics that will be present, we plan to show off modern Atari related(!) gear and projects. As always there is plenty of space available to play games on your favourite console, computer and through emulation you can play the classic Atari arcade cabinets too! Want to join in on the fun as part of the crew, let us known. If you just want to take a look around, we will be in 'het Trefpunt' all day. Doors open at 10.00 and close at 16.00.